Lion dancers lead the parade up Yaowarat Road on the first day of the Vegetarian Festival in Bangkok. 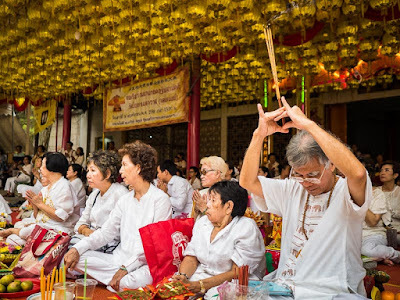 The Vegetarian Festival is one of Thailand's signature events. 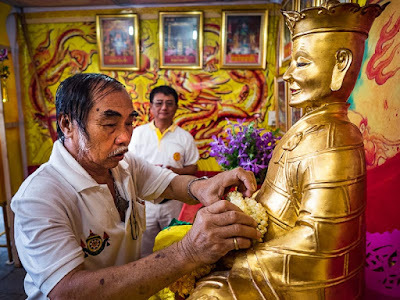 It's a Thai adaptation of the Taoist Nine Emperor Gods, a nine-day celebration beginning on the eve of 9th lunar month of the Chinese calendar. It's celebrated in China and in Chinese communities throughout Southeast Asia, like Thailand, Malaysia, Myanmar and Singapore. The most famous celebration of Nine Emperor Gods festival is in Thailand. 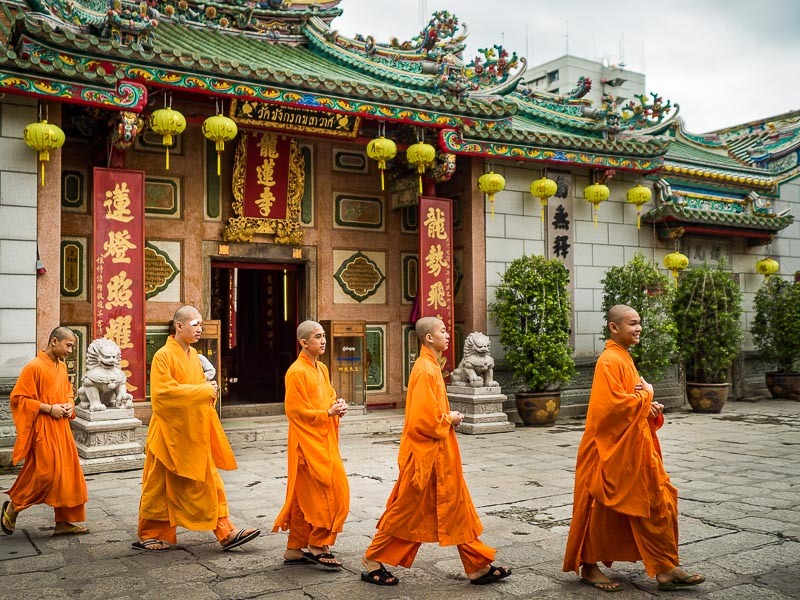 Bangkok and Phuket have the largest Chinese communities and best celebration of the Vegetarian Festival. For the nine days of the festival people eschew meat and strong flavorings (i.e. spices and garlic). It's a strictly vegan lifestyle. Cooking up an order of vegetarian noodles at a food stall on Yaowarat Road in Bangkok's Chinatown. In Thailand, Phuket is the place to go to for the Vegetarian Festival. Devotees impale themselves with knives and metal tools, there's lots of fireworks and, at the end of the festival, firewalking. It's become a huge draw for tourists, not only from the US and Europe but also Singapore, Malaysia and Thailand. I've never photographed the Vegetarian Festival in Phuket. Coincidentally, there's a lot going on at this time of year (the Shia Muslim holiday of Ashura and the Hindu festival of Navratri, also a nine day festival) and I've covered those instead. This year is no different. I'm on my way to Yangon to photograph Ashura. I'm not going to Phuket because I would miss the climactic end of the Vegetarian Festival to get to Yangon. Novices from a Mahayana (Chinese Buddhist) temple in Bangkok walk to a ceremony to start the Vegetarian Festival. The Vegetarian Festival in Bangkok is more subdued. It doesn't have the extreme display of body piercings or nearly as many as fireworks. But there is great vegetarian food and a good selection of Chinese operas. I plan to photograph a couple of Chinese operas this week before I go to Yangon for Ashura. 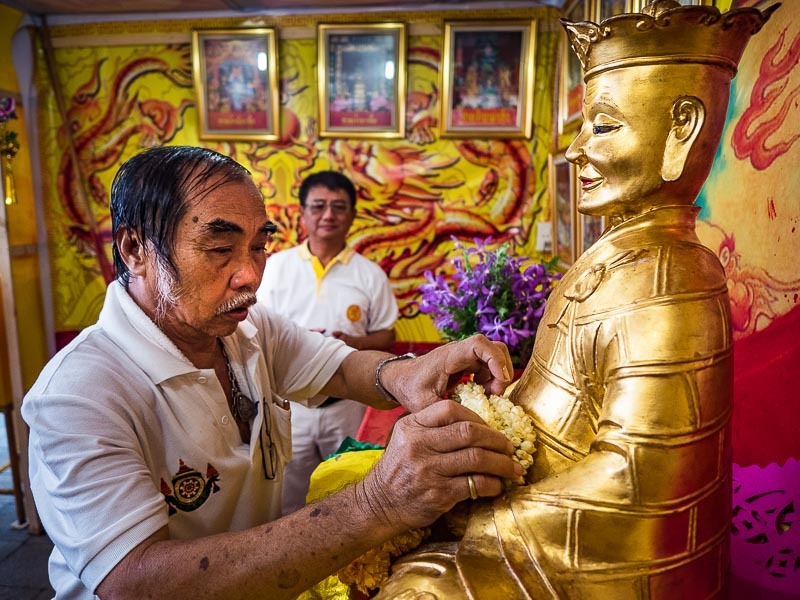 Prayers at a Chinese temple in Bangkok at the start of Nine Emperor Gods. 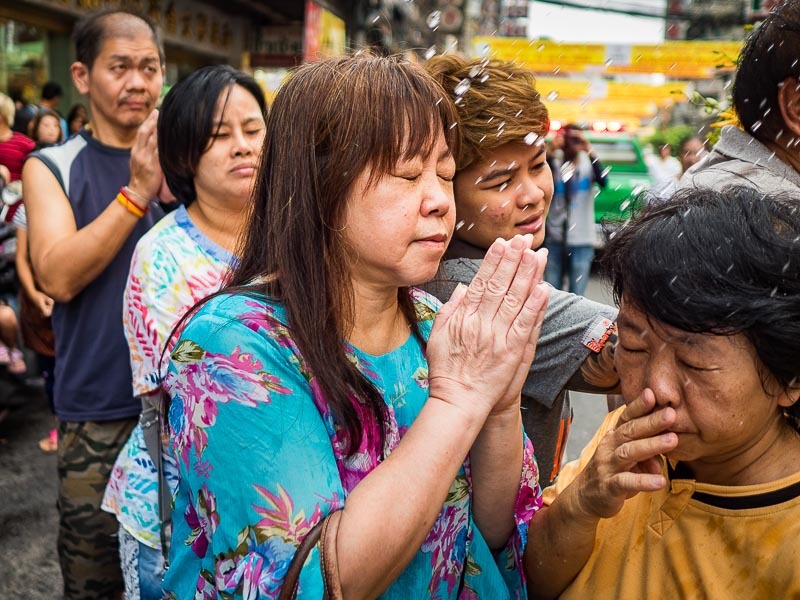 People pray in the street while Mahayana monks sprinkle them with holy water. 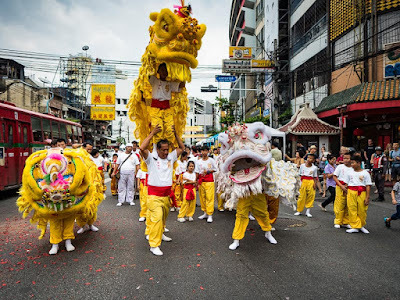 If you're in Bangkok and you want to get in on some of the Vegetarian Festival activities head down to Yaowarat Road late in the afternoon or early in the evening and go walk about. There's a huge variety of vegetarian food everywhere. Shops selling vegetarian food are marked by signs with red type on a yellow field. The signs are in Thai but there's no mistaking them, they flutter like flags in front of all the shops. Just be forewarned that "vegetarian" in this case is not heart healthy. There's no meat (and there's not supposed to be any fish sauce - food is supposed to be vegan) but things are pan fried, deep fried and stir fried, you get the idea. There's a lot frying. And there is a huge selection of desserts, from Chinese biscuits (cookies) to peanut brittle to ice cream (made with coconut milk, not dairy and really more of a sorbet) so it's not a particularly good place to watch your weight. 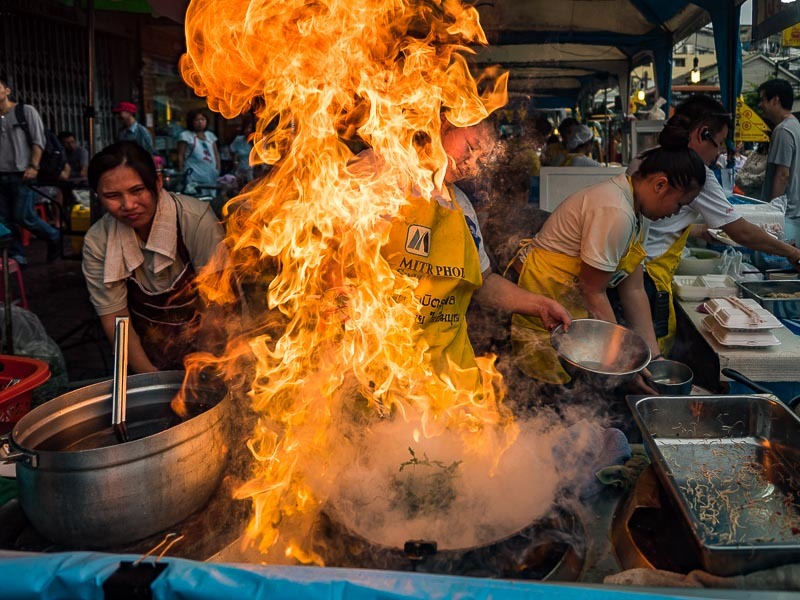 The food is also more bland than Thai food usually is because they eschew spices and strong seasonings during the Vegetarian Festival. But don't worry, even if they don't use spices in the preparation, most of the stands have chillies and spices available so you can still get your chilli fix. 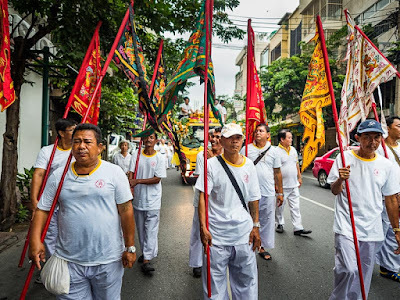 Devotees of the Nine Emperor Gods march through Bangkok Chinatown on the first day of the Vegetarian Festival. While a man makes merit by presenting flowers to a statue at Odian Circle, considered the gateway to Chinatown. There are more photos of the Vegetarian Festival in my archive.